Here is a simple worksheet that will surely amaze your little kids. 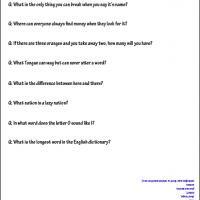 This contains some easy and fun riddles that they can solve. Just print this and ask them to solve but tell them not to look at the answer key below.